Prominent & Leading Wholesaler from Chennai, we offer foldable metal cot. Perfect for overnight stays at guests, grandparents or friends, the Alfonso Foldable Cot looks like a standard metal finishes tubular construction and folds when not in use for easy storage. 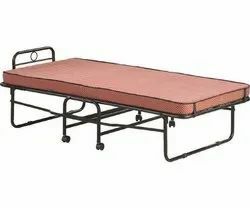 Specifications UsageResidentialStyle SelectionClassicMaterialCast Iron More Details Legs Thickness:1 InchesFrame dimensions:L75 x W36 x H24 InchesRecommended mattress size:91 x 189cmwarranty :24 months manufacturing defect. Looking for Foldable Cot ?